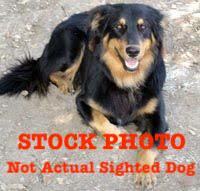 Additional Notes: Skittish Black/Tan Aussie mix sighted roaming in South End Halifax near Dalhousie. Barking, and could not approach as the witness had her own dog with her. Some other people stopped to help and it is unknown if they had success in rounding up this adventurer as they were very spooked and barking. Please share so this dog gets back home safely, thank you.